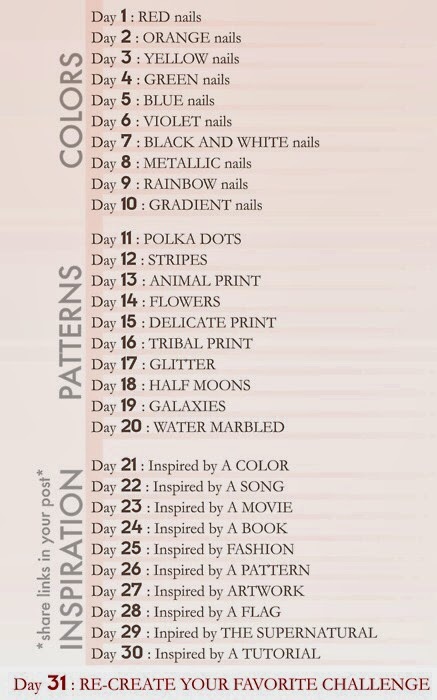 Inspired by the magnificent Margriet Sijperda at 356 Days Of Nail Art, I toyed with the idea of trying an ongoing nail art challenge. There was no way I could jump in and make the commitment Margriet did, but I was keen to try something. The first hit on Google was Nail Art 101, and I shared the challenge on G+, so I could stew over it for a while. Then I got an offer that meant there was no turning back, a challenge buddy..... Then another, and another, and it snowballed to 11 in total. So that's it - I'm locked in, and we start on April 1st. The programme is pretty straightforward. 10 days of colour mani's, 10 of patterns, 10 mani's by inspiration and the final day is a chance to recreate your favourite challenge, which is something I've never done. What am I talking about? I've never done a challenge like this! To say thank you for keeping me company through the next 31 days, here's some quick links to the lovely ladies who are joining me. I am hoping to post my challenges here everyday, and if I can find the time, maybe a couple of how to's and group challenge collages. Unfortunately, I haven't the time to post everyone's mani everyday :-( But I'll do my best to share the love.